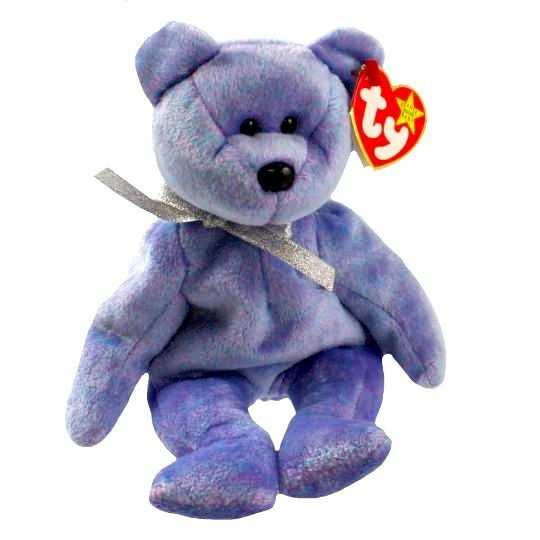 Clubby II is made from a blue material flecked with purple. He has black button eyes and a larger black button nose. He wears a silvery coloured ribbon tied around his neck. Clubby II was released on 1st May 1999. His birthday is on 9th March 1999. Clubby came with a Beanie Baby Official Club (BBOC) Platinum Membership Kit along with a certificate, a pack of collectors cards, a Platinum membership card, a checklist, one Original Nine coin and a newsletter all inside a plastic case. He was the first bear to be included with a BBOC kit. Occasionally, Clubby II would have the wrong tush tag. He has been spotted with a Clubby tush tag instead of Clubby II. He retired on 23rd December 1999.